The red velvet cake’s entry into popular culture can probably be traced to the 1989 film Steel Magnolias, in which the groom’s cake was a red velvet cake in the shape of an armadillo. There’s something seductive about the color of a red velvet cake, especially a cupcake, at least at first. But at some point, the red seems just a little too red, and it starts to seem a bit unnatural. That’s no surprise considering that a recipe will use up to several tablespoons of red food coloring. Doing some research, I gathered that red velvet cake was originally not so red and the color came about naturally. Cocao powder, a key ingredient, didn’t used to be “Dutch process” and was less alkaline in years gone by. When combined with the buttermilk and vinegar in the recipe, the chemical reaction caused the batter to take on a muddy red hue. 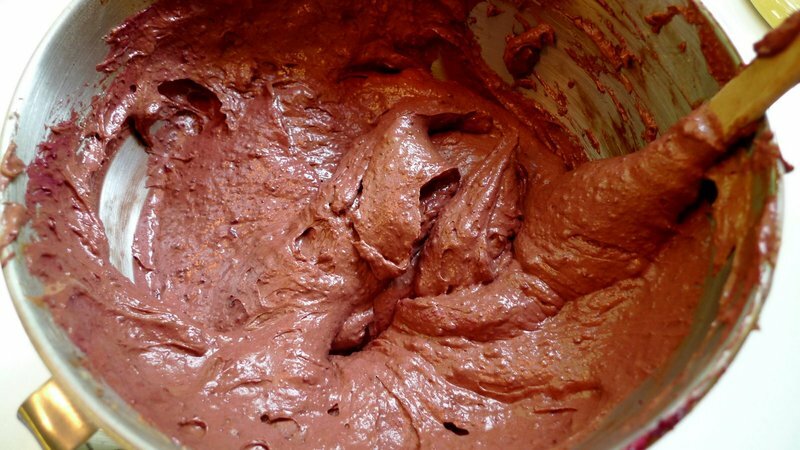 Unable to find cocao powder that isn’t Dutch process here in Thailand, I stumbled upon a recipe for Natural Red Velvet Cake that, supposedly based on a traditional southern recipe, uses cooked beets for the color. Intrigued, I had to try. 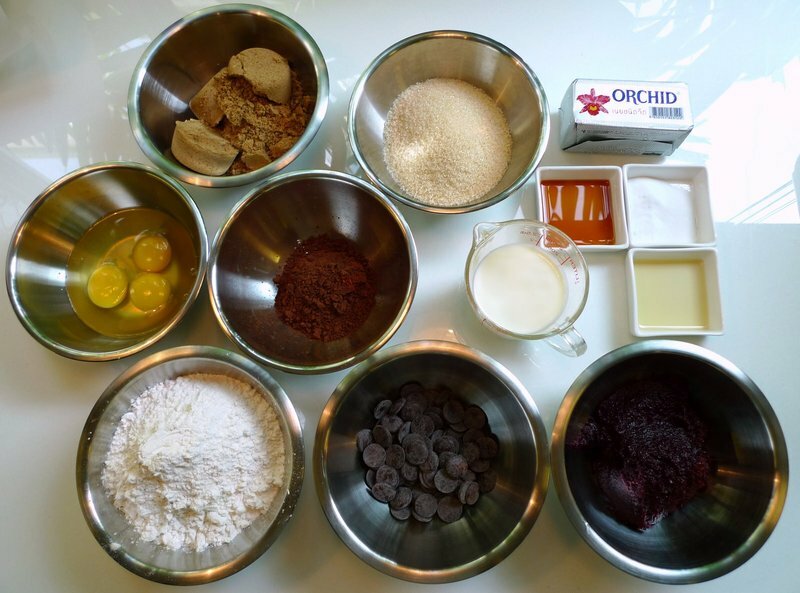 The ingredients: brown and granulated sugars, eggs, flour, cocoa powder, chocolate, buttermilk, butter, vanilla, salt, baking soda, cider vinegar, and roasted beets. The mystery ingredient. 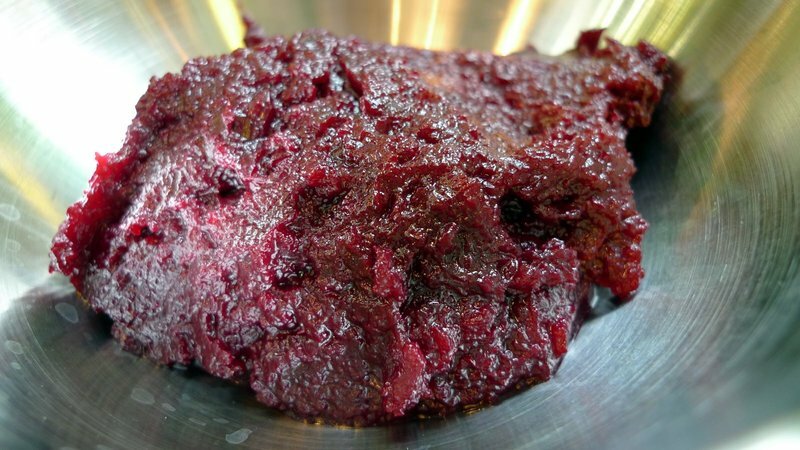 Instead of using canned beets, which the recipe called for, I roasted my own beets and then pureed them with a little bit of olive oil and water. First step: Melt the chocolate over a pan of simmering water. 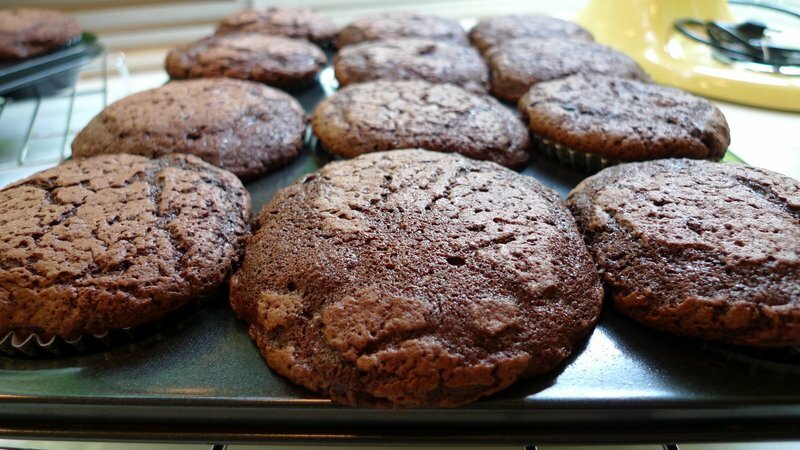 Chocolate doesn’t figure in most red velvet cake recipes, only cocoa powder, so I was surprised by this addition. 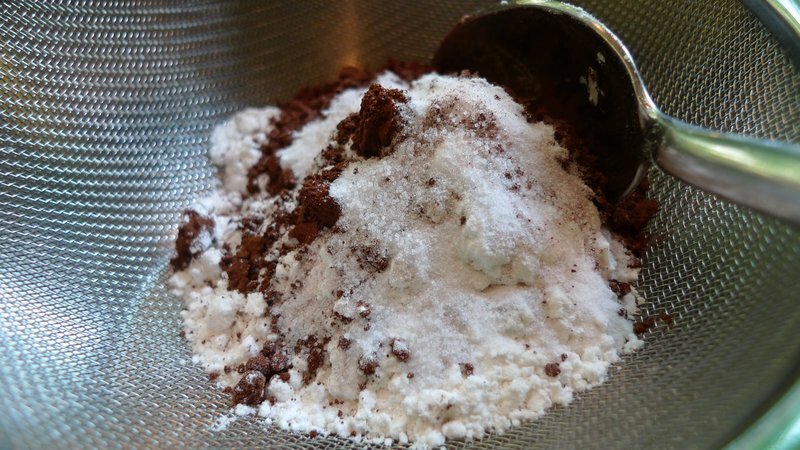 Sift together the flour, cocoa powder, salt, and baking soda. One of these days I’ll have to seek out natural cocoa powder (i.e. not Dutch process) and see how that affects the outcome of the recipe. 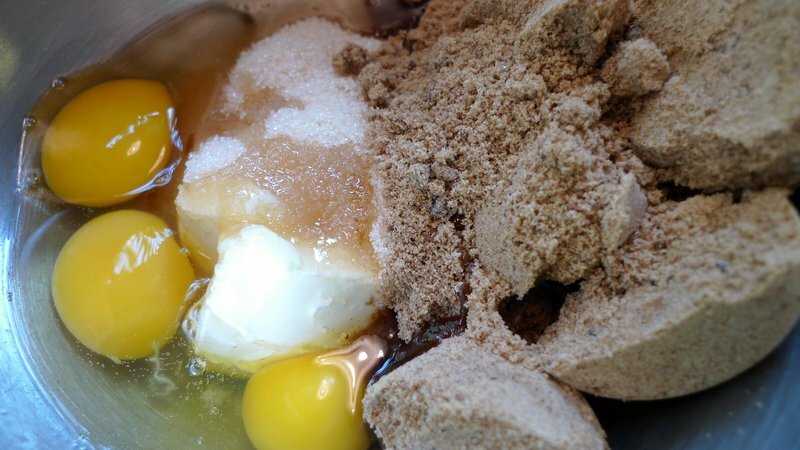 Cream together the eggs, butter, and two types of sugars. 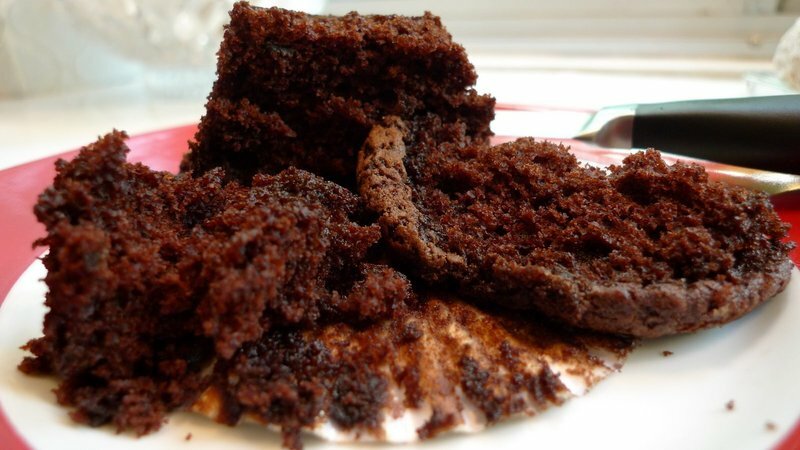 Most cake recipes are specific about the process – for example, whip the butter and sugars before adding the eggs. No specificity here so I just dumped them all into the bowl and turned the mixer on. The end result (after combining the dry ingredients and adding the melted chocolate and beets) had a vaguely reddish tinge to it, although that could just be a color correction issue from the light. Cupcake liners filled and ready to bake. Lesson I’ve learned: don’t fill your cupcake liners so high because cake batter expands as it bakes. See? I told you that cake batter expands. Now I have these muffin top cupcakes that would have been interesting if the crumb had held together better, but the structure was kind of weak. The cupcakes pretty much crumbled when unwrapped. I’m very curious why this is. Maybe cake flour didn’t have enough protein and regular flour would have been better? Maybe just a little too much liquid in the beets? Baking is a science and something didn’t work out right here. 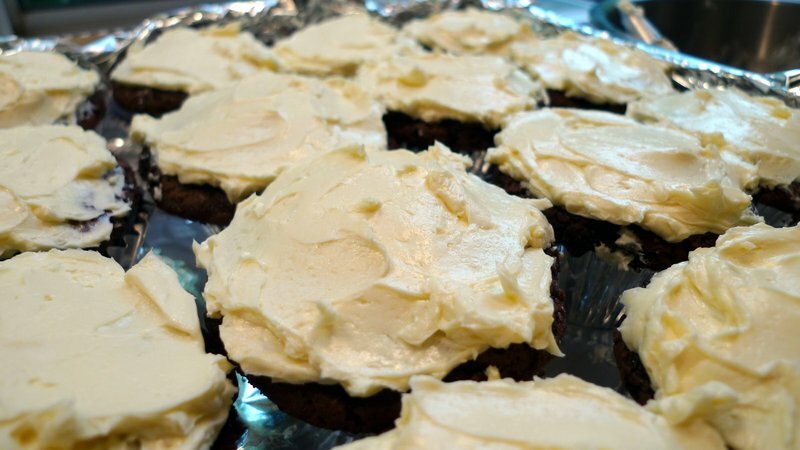 To frost the cupcakes, I prepared a butter-cream cheese frosting but perhaps didn’t whip it enough. That, or the opening in the frosting tip was too small. The frosting bag actually burst on me so I had to instead spread the frosting instead of piping it. The end results looked a bit rag-tag. I really need to take a class to learn how to frost a cupcake properly. As for the taste, the cupcakes were very moist and the beet flavor wasn’t noticeable at all. 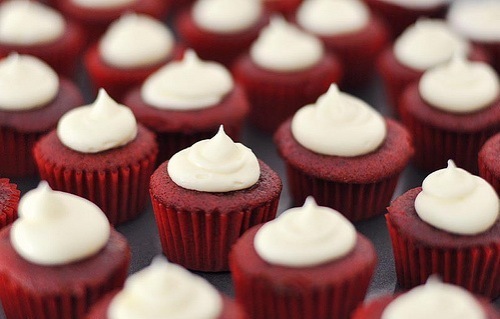 As for the color, though, there really was nothing red about the red velvet cupcakes. Not in the least bit. I guess if I want a really red, red velvet cupcake, I may need to reach for the food coloring after all. This entry was posted in Uncategorized and tagged baking, Beets, cake, cooking, cupcake, food, red, velvet by christao408. Bookmark the permalink. Hey, sometimes experiments don’t always pan out like you hypothesize. It was interesting to see the process though! huh, interesting. i think what you need is the liquid that comes out of the beets, which you don’t get as much of when you bake them. i usually steam my beets and they always drop red juice everywhere, maybe if you treat the beets that way you might get more red color. 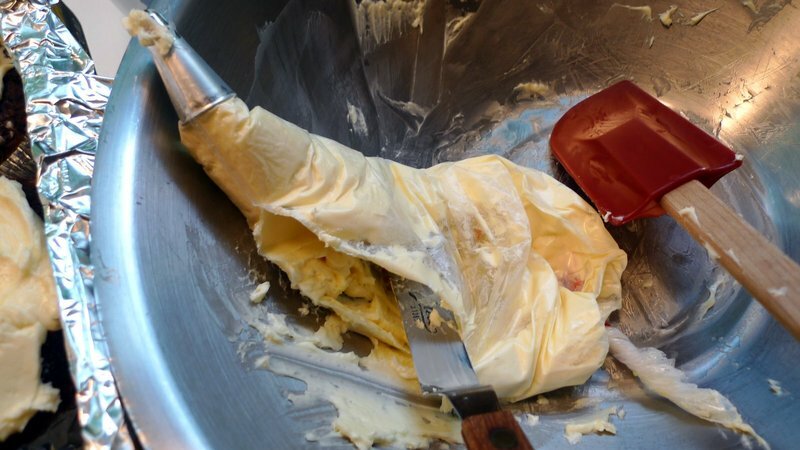 of course, that will also increase the liquid in your batter, so you may have to compensate.as for creaming the butter… i always thought that you have to incorporate the sugar and butter first to get air into the butter before you start adding in eggs. 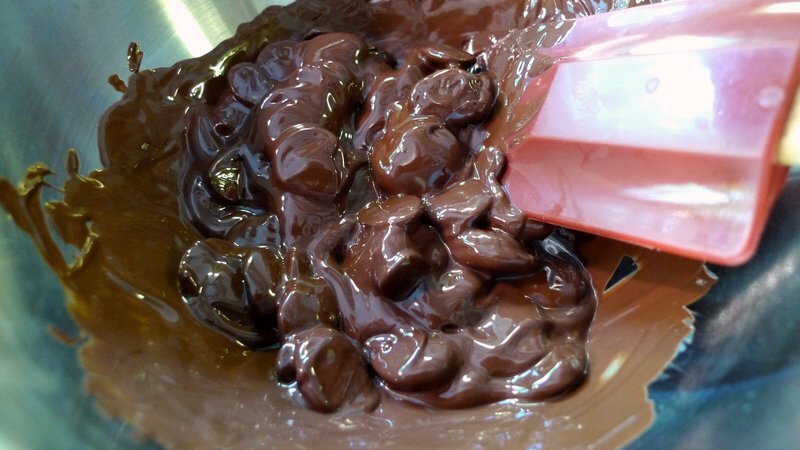 i wonder if that affected your texture.the other thing i just thought of is that you melt the chocolate down, which is interesting because that adds more fat (cocoa butter) into your mixture. i know the recipe calls for that, but that will definitely affect the consistency also. Very interesting… and now you’ve made me hungry for sugar. I think the canned beets would have been better – more color and less oil. As for the chocolate, I always thought the cocoa powder was sufficient. Melting chocolate is too much trouble! Better luck next time… (and I’m sure there will be a next time.) hehe! I have never had red velvet cake! It’s true I always picture that armadillo cake from Steel Magnolias when I hear about it….not so appetizing! 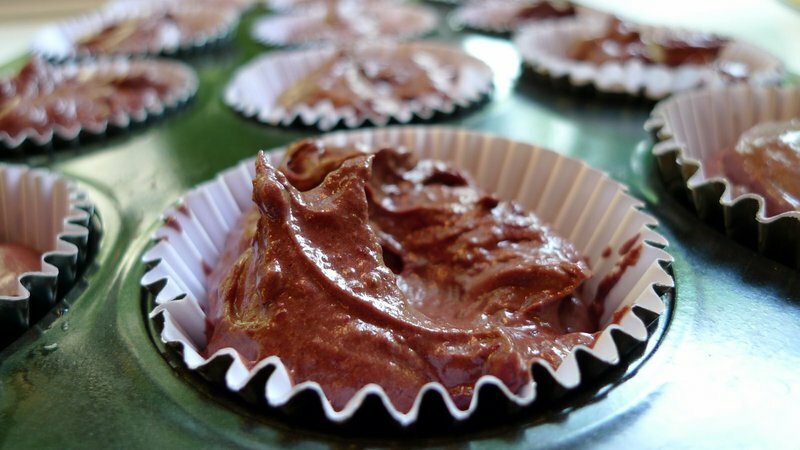 Interesting experiment – I have added vegetable purees to all sorts of things over the years, including baked goods, for increased health for my kids. I have not done beets, though. Haha, I was just talking about Steel Magnolias the other day with my mother. Ah, quite an interesting process to observe the end results! I can get you some cake batter and fillings from Trader Joe’s, just let me know what kind. Not sure what caused the breakdown. I read Aaron comment and I have to go along with him. @kunhuo42 – The idea of steaming the beets is a good one. One of the two recipes I consulted called for canned beets including using all the liquid, so you may be onto something. You know, Aaron, I look forward to the day when we can bake together! So much I’ll learn from you… LOL@Roadlesstaken – That seems to be the case with many of my cooking attempts… =(@Passionflwr86 – This blog entry brought to you by the high fructose corn syrup council of America… Ha ha. @yang1815 – Um, yes Edward. We can bake you some Bella blood cupcakes. @murisopsis – I’m not sure I understand the need to add melted chocolate, either. Maybe if I try another recipe. @turningreen – Adding veggie puree to things is a great way to add some nutrition to items, especially when dealing with picky children. The nice thing beets is that they don’t have an overt flavor so they hide nicely in baked goods. @flann00 – Must be meaningful coincidence, then, that I baked this. @CurryPuffy – Thank you for the offer. I’m okay mixing from scratch considering how infrequently I bake a cake. @Fatcat723 – Yeah, Aaron generally is more expert in the baking department. @AppsScraps – One of these days I’ll learn how to do it properly. @christao408 – Me no get the Edward reference. Please explain? @christao408 – ha, it’s more likely you’ll teach me some things! the basics i learned from my mom, but the rest of what i know is self-taught. @christao408 – True. And I do tell my kids the veggies are in there. They are not picky eaters and love their veggies! I’ll throw in my 2 cents. I like Aaron’s idea but maybe you have to reduce the liquid from the beet, more flavour, less water and perhaps concentrated colour. I have zero baking experience (aside from muffins). @yang1815 – I think it’s a reference to Twilight. I am quite jealous of your cooking and baking skills! It all looks fantastic! Have you ever had a go at making any tradition British food? @ElusiveWords – thank you thank you sir. is that the guy who doesn’t own a shirt? or the guy who doesn’t like the guy who doesn’t own a shirt? @turningreen – Good for them! I love vegetables and did as a child. @kunhuo42 – Well, if you are learning from me than it most definitely is the blind leading the blind! LOL@yang1815 – The second one. @Swiftonik – A former roommate from London claimed my buttermilk biscuits were a dead ringer for scones… Does that count? @ElusiveWords – There are a few other versions of the recipe I have so I might try one of them. The thing is, I’m not a big fan of cake anyhow so am not in a huge rush to try it again. I found the same thing. I made red velvet cupcakes for Christmas with beet juice. I was thinking how amazing they would be with green icing. when i started to mix in the beet juice originally the batter was red but as I mixed in everything else it slowly became more and more brown. The taste was a bit more earthy but it was still very good. However I do wish I had the brilliant red.